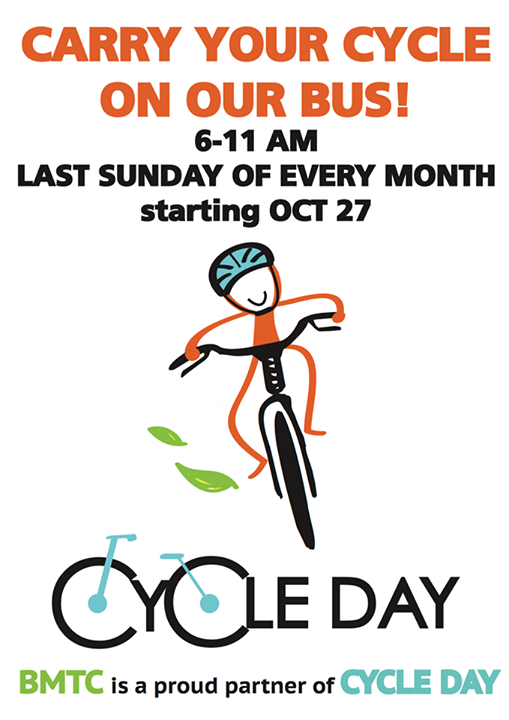 Last Sunday there was a campaign in Bangalore called Cycle Day. It was not immediately clear who was organizing it or what the campaign was for; but the usual phrases about "Green" and "bicycling" and "reducing traffic" seemed to float around. 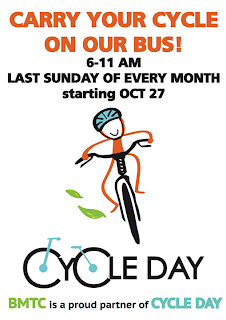 One of the concrete things about the event was that BMTC, one of the 'partners' for the event, had launched a scheme to allow carriage of cycles in bus for free on the last Sunday of every month from 6AM to 11AM. The venue was Cubbon Park, and a fairly large number of bikers showed up at 7AM which was the scheduled time. We were told that the Mayor of Bangalore would be coming shortly, so we spent the time riding around in the park. When the mayor did arrive he inaugurated a bicycle stand at the Hudson Circle entrance, gave a brief interview to mediapersons then rode a short distance with the crowd. Traffic police had halted all vehicular traffic at the Cubbon park circle, leaving some motorists miffed. Surprisingly, there was no mention of BMTC scheme. One of the problems with most public transport systems is last mile connectivity. Talk of putting cycles in or on buses, even for BMTC is not new. 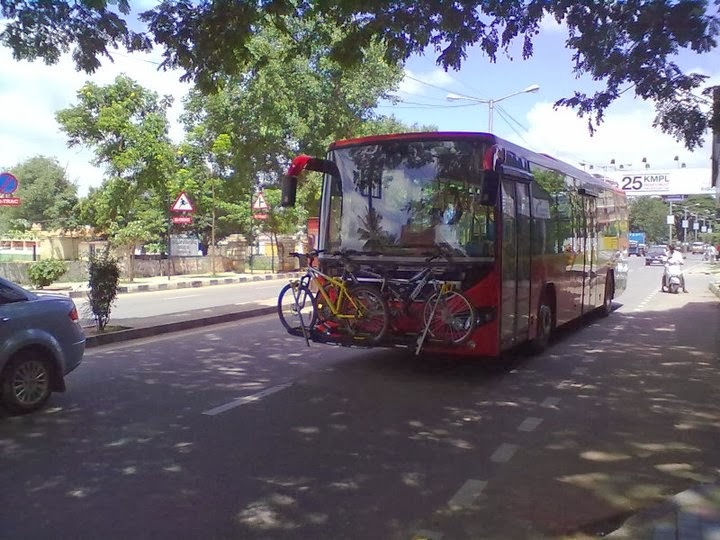 A couple of years ago there was some pilot testing of bike racks on the BMTC Vajra (Volvo) buses but apparently that led nowhere. The general feeling was that BMTC is not really interested in pursuing the cycle + bus scheme, and unless one owns a folding bicycle this is not too feasible at the moment either. On the whole the event seemed to do little other than upset the walkers and runners, who are regular users of Cubbon park).